When I moved to Laurinburg, North Carolina, in June to teach at St. Andrews University, one of the first people I met was Ronald H. Bayes, poet, esteemed professor emeritus in Creative Writing at St. Andrews, recent inductee into the North Carolina Literary Hall of Fame, and the one with a lively twinkle in his eye at the lunch table he shared with seven other residents in the retirement community, Scotia Village, adjacent to the campus where Ron taught for nearly five decades. “Do you still write poems?” I asked, pulling up a chair from a nearby table. “Watch your mouth, Ron,” a resident across the table scolded. It was the liveliest table in the second floor dining room that day and for many after. 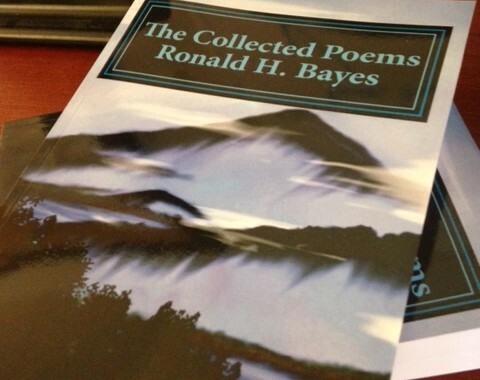 Not only is Ron Bayes’s body of poetry large and varied, his abiding affection for other artists and theirs for him is evident. His friends numbered many of the Black Mountain poets, choreographers, composers, and artists, most of whom visited St Andrews and Ron during the 1970s. Ron cofounded the St. Andrews Press and with Ted Wojtasik (who along with Joseph Bathanti selected and edited The Collected Poems) formed the mainstay of the university’s longstanding BFA in Creative Writing. On walls in buildings around the campus, including in the Orange Lounge, where published writers and students on Open Mic nights have read weekly as part of the Writers Forum for forty years, photographs on the walls show Ron with Carolyn Kizer, Robert Creeley, and Mary De Rachewiltz, among others, and alway, always with students. My mother also lives at Scotia Village and for a brief time was a member of the lively lunch table before health issues moved her on to another level of care. One of her favorite nurses there, tall, athletic, a poetry student of Ron’s, a St. Andrews grad from the early 1980s, scholarship basketball player, told me he’d never had a better teacher, never had anyone make him care so much about poetry. “Everyone loved him…and loves him…everyone,” said another longtime colleague.